Buttressing my initial argument is a 2011 paper, “From Militant Secularism to Islamism: The Iraqi Ba’th Regime 1968-2003,” in which Amatzia Baram provides evidence from Iraqi internal documents and tapes of Cabinet meetings captured after the fall of Baghdad to show that Saddam’s regime had formed an alliance with Islamists in the mid-1980s for use in its foreign policy, and from a bit later in the 1980s had begun steps toward Islamizing Iraq internally. The Islamization was accelerated during Saddam’s occupation of Kuwait, from August 1990 to February 1991, and intensified even further after Saddam’s defeat in Kuwait and the imposition of the international sanctions. The Faith Campaign, begun in 1993, is the key event in Saddam’s Islamizing Iraq. Baram argues persuasively that while the Ba’ath regime’s initial resort to Islamism was likely cynical, by the end Saddam seems to have been a believer, and in any case the Faith Campaign took on a life of its own—one that is still very much with us. Saddam resisted the “return of Islam” through the 1970s. After Shi’a riots broke out in Najaf and Karbala in February 1977, and had been brutally suppressed, Saddam gave a “series of programmatic lectures … on the relationship between Islam and politics,” Baram writes. Many who claim the Ba’ath regime was secular point to the fact that Ba’athism’s founder, Michel Aflaq, was a Christian, but in fact Aflaq converted to Islam, and when Saddam, in these lectures, “dissociated himself from atheism (al-ilhad),” he was following in Aflaq’s footsteps. Saddam did say that the Ba’ath was “not a religious party, nor should it be one” and defined the shari’a as “ancient jurisprudence,” and he added that trying to outbid the religious was foolish since the Ba’ath could not beat them at their own game. In the wake of the Islamic Revolution in Iran in February 1979, “growing numbers of Iraqi citizens started to frequent the mosques not only in the Shi’i, but also in the Sunni areas.” Within days of the collapse of the Shah’s regime, demonstrations erupted against the Iraqi Ba’ath regime in the Shi’a south. Many Shi’ites expected “an Iraqi Khomeini” to arise, and many believed Muhammad Baqir as-Sadr was the man. Saddam cracked down ferociously, including the savage murder of Grand Ayatollah Baqir as-Sadr and his sister Bint al-Huda in April 1980, but it still took over a year to pacify the country—and in September 1980 Saddam went to war with the Iranian revolution directly. Between 1979 and 1982, for the first time under Ba’ath rule, there was a noticeable uptick in religiosity, even among party members, according to Baram, and “Iraqis began again to identify Islam with power.” Saddam responded, as he had in 1977, by trying to hold the party firm against a slide into Islamism, convening the Ninth Regional Iraqi Party Congress in June 1982, at which the Ba’athists condemned al-tadayyun (ultra-religiosity) amongst the youth and especially the Shi’a. The turn by Saddam to the Islamists for use in his foreign policy can actually be dated earlier than Baram does, to 1983: Helfont notes that beginning with the “Popular Islamic Conference” of that year, Saddam used Marouf al-Dawalibi, a former Prime Minister of Syria who had close connections to Saudi Arabia, to bring Islamists from around the world to Baghdad to speak on his behalf, and relations often went beyond the rhetorical. The influence of these conferences was expanded in 1987 when Saddam set up the Popular Islamic Conference Organization (PICO) with a permanent headquarters in Baghdad. When Saddam abolished Kuwait and the Gulf States turned on him, Saddam was able to use PICO to outmanoeuvre the Khaleeji States, who bankrolled most of the Islamists, because the Islamists—especially the rank-and-file—sided with Saddam-the-avenger, who was sticking it to the Americans while the Gulfies were their allies. Moreover, Kanan Makiya argues in The Republic of Fear that even before the privation brought about by Saddam’s wars, Saddam had chosen, from a position of strength, to present his regime with Islamic characteristics, and that Ba’athism was always “bound up” with Islam, historically, politically, and societally, in such a manner that it “renders the term secularism useless with respect to understanding Ba’thi politics.” Makiya notes that it wasn’t just Islam that the Ba’ath regime drew on. Saddam’s regime was deeply reliant on the Tikriti clans from which he hailed, members of which held nearly all the senior military and political posts, and practices like “breaking the eye” were imported to the cities as a means of social control. Sunni sectarianism, especially after the 1991 Shi’a Uprising, was also a major element of the Saddam regime. But Islam had always been there as a source of legitimacy, and even the Shi’a had “a hard time demonstrating that the Ba’th are not good Muslims,” Makiya wrote. At the time of the 1986 PAL meeting, Baram records, Saddam seems to have still disdained the Islamists, believing them to be backward and repressive. Hassan al-Turabi, the mastermind behind the Islamist coup that brought Omar al-Bashir to power in Sudan in 1989 (called the “pope of terrorism” by some), was a particular target of hatred and fear for the Iraqi Ba’athists. But in 1990, after Saddam annexed Kuwait and was under threat of Western military action to get him out, Turabi turned up in Baghdad. Other luminaries of Salafi-jihadism, including the leaders of the Algerian Islamic Salvation Front (FIS), Abbas Madani and Ali Belhaj, would come to Baghdad to declare their support for Saddam Hussein before Operation DESERT STORM began. February 1982: The Muslim Brotherhood-led rebellion in Syria is repressed at Hama. Some of the Brothers had been trained in Saddam’s Iraq and others had been financed from Baghdad; a number of the survivors fled to Baghdad. April 1983: The first Popular Islamic Conference (al-Mutamar al-Islami al-Shabi) is held, denouncing Iran as an aggressor. August 28, 1984: A memo was sent from Saddam’s Secretary for Party Affairs to the dictator suggesting that, in order to bring the hawza under control, “advanced Party members” should “become clerics … and influence the spirit of the citizens …, especially in the Middle Euphrates provinces.” In other words, the regime should infiltrate Shi’a mosques and bring them under regime direction. Saddam signed-off on the idea a week later, and in November the regional parties wrote back proposing their candidates, though amusingly the Euphrates Organization produced one candidate from Babil and the South Organization dryly responded: “No one in our organization would like to work as a cleric.” The areas targeted had virtually nobody willing to take this risk. Candidates were brought for training at the Ministry of Awqaf on December 2. The outcome of this scheme is unknown in detail, but it never produced the regime-loyal Ayatollah the Ba’athists wanted to preside in Najaf. Later, during the Faith Campaign, this method would be adopted in an attempt to co-opt the Sunni mosques and brotherhoods the regime now officially supported; it set the stage for the largest misfire of the whole program. “Most of the officers who were sent to the mosques were not deeply committed to Baathism by that point, and as they encountered Salafi teachings many became more loyal to Salafism than to Saddam,” writes Joel Rayburn (p. 102). What Saddam intended as regime infiltration and manipulation of religious ranks became a door-opener for deep permeation of Salafism/Islamism into the regime’s security forces. July 24, 1986: The Pan-Arab Leadership meeting decides on a tactical alliance with foreign Islamists. December 27-28, 1986: Saddam performed the umra pilgrimage to Islam’s holiest site, the Kaaba in Mecca. February 23, 1988: Though the destruction of Kurdish villages has been ongoing since 1986, the military operation proper, an ostensible counterinsurgency, against “prohibited zones”—those areas where Kurdish rebels operated or were believed to have influence—now began, lasting formally until August 26 but the killing extended well beyond the September 6 “amnesty”. The campaign, later designated as genocidal, will always be associated with the name Ali Hasan al-Majid (“Chemical Ali”) and his use of chemical weapons of mass destruction to slaughter 5,000 people in Halabja on March 16. But these chemical attacks—which also struck Shaikh Wisan, Guptapa, and Tuka—were a sideshow to the systematized massacres, which took as their model the 1983 rounding up of 8,000 Barzanis and their shooting to death in the southern deserts (an incident that was itself found to constitute genocide by Iraqi courts). At least 100,000 Kurds were murdered and 1,200 villages were destroyed in the 1988 operations. Saddam named them al-Anfal (the spoils [of war]), a phrase taken from a Surah of the Qur’an. June 1989: The Ba’ath ensured mention of Aflaq’s conversion to Islam in his death notice. “Had the party not wanted to give it ‘a political interpretation,’ they could simply have refrained from any mention of this highly significant conversion,” Baram notes. Mid-1990: The Saddam Centre for the Reciting of the Qur’an was established at the (Sunni) Imam al-Azam Mosque. This was the beginning of a “massive campaign designed to turn the study of the Qur’an and Hadith into a national intellectual focus,” Baram reports from the documents. By mid-1992, some 60,000 students were attending Qur’an memorizing courses in mosques. January 13, 1991: The phrase Allahu Akbar was added to the Iraqi flag. 1991: Saddam introduced Islamic banking. 1991: Beginning this year and continuing every year to the end, ten new middle- and high-school madrassas were opened. 1991: A massive mosque-building campaign began. 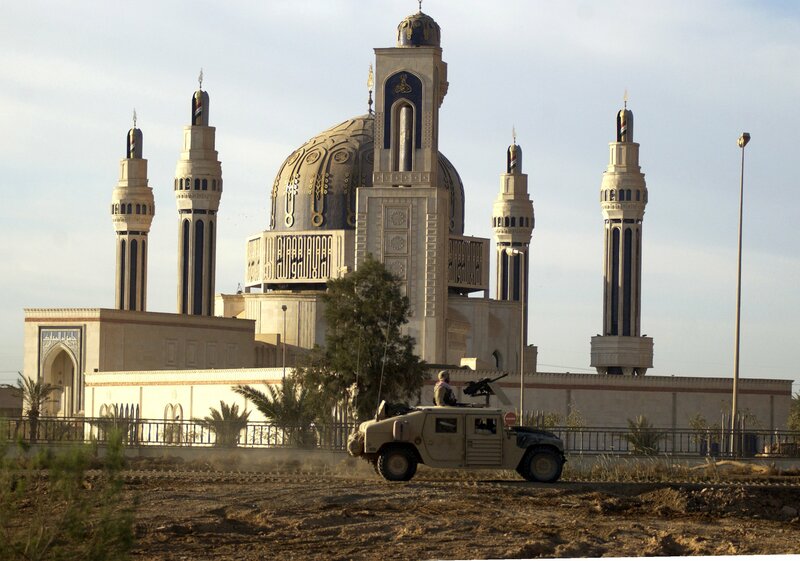 Probably the most notable was the Umm al-Ma’arik (Mother of All Battles) Mosque that Saddam unveiled on his sixty-forth birthday, April 28, 2001, having announced planning for the mosque exactly three years before in April 1998. Dedicated to his “victory” in DESERT STORM, the mosque had minarets shaped like Scud missiles standing at “37 metres (120ft) high; there are four more minarets next to the mosque’s dome that resemble huge machinegun barrels, each 28 metres (93ft) high. Taken together, the numbers 37-4-28 give the date of birth of the megalomaniacal leader. … The huge dome of the mosque is inscribed in Arabic lettering with the word ‘La,’ meaning ‘No’ in Arabic. ‘This is the biggest “No” ever given to the Americans,’ said [the mosque’s director of information Dahar] Al-Ani proudly.” In May 1994, Saddam began work on the Great State Mosque, meant to be able to hold 20,000 people, in al-Mansour in the heart Baghdad, according to Baram. It seems the project was actually begun in 1995 (and other reports suggest perhaps later in the 1990s) and was better known as the “Great Saddam Mosque” or “Grand Saddam Mosque,” and renamed Masjid al-Rahman after the regime was removed. At all events, it was never finished, like so many others. Planned to be the biggest mosque in the world—thus the “closest to god”—the effort was instead a testament to the mania that overcame the regime amid scant resources. Even so, a lot of mosques were finished: by the end of the 1990s, Iraq had (p. 108) moved from the mosque to population ratio of 1:37,000 it had in mid-century to a ratio of 1:3,500. 1991: In the wake of the unmerciful repression of the March 1991 Shaaban Intifada, the Shi’a rebellion that had been encouraged and then betrayed by the U.S.-led coalition that evicted Saddam from Kuwait, Saddam made a special show of his personal involvement in rebuilding the shrines he had demolished and donating nearly a ton of pure gold—and much more silver—to rebuild madrassas and pilgrimage sites. October 1991: The Revolutionary Command Council (RCC), the executive and the legislature of the Saddam regime, imposed zakat, the Islamic poor tax. August 1992: Saddam ordered the “Ministry of Education to make sure that every teacher would go through a new examination, testing his/her knowledge of Islam. … Saddam instructed the teachers to start teaching Qur’an right from the first grade of primary school.” The result of this was darkly humourous, Baram notes, with “the newly-recruited teachers [teaching] the six years olds about issues of personal status and about the fires of Hell,” leading to parental complaints and childhood nightmares. The intelligence services immediately became more tolerant of more frequent visits to the mosque; before the Faith Campaign this was a key behaviour that marked someone for extra attention. September 1993: The Ministry of Interior closed down twenty-nine of Baghdad’s forty-five night-clubs and all-but five discothèques, and permitted the remainder only in certain districts of Baghdad. September 1993: The public consumption of alcohol was banned and punished with a month’s imprisonment. Saddam did not try to ban the production of alcohol—even in its demoralised state the Ba’ath would have resisted that—but only non-Muslims were permitted to run liquor stores and such stores were banned within 150 metres of a mosque. October 1993: Saddam ordered that religion teachers be given a monthly allowance of 100-150 dinars over and above their regular salary, making Qur’an teachers the best-paid in the country, vastly increasing their numbers, and redeeming the job from its status of cultural inferiority. The ulema (clerics) on all side applauded the decision—whether out of conviction of avarice is impossible to tell—and the Ministry of Education added religious studies to the examination to get into university. 1994: Very much modelled on Saddam University, the regime set up (p. 266) the Saddam Institute for the Study of the Holy Qur’an, which aimed to provide an “interpretation of the Qur’an. Needless to say, these interpretations were highly influenced by the regime.” By the early 2000s, there were three centres—in Baghdad, Basra, and Ninawa—with at least 1,000 graduates, at least a fifth of them active party members, and the Ba’ath had been a concerted organization effort to send senior members of the party to the Institute, giving them as much as two years paid leave to study religion. May 1994: Gambling was banned. June 1994: By this point, the Ministry of Awqaf (Religious Endowments) had produced 60,000 Qur’ans. October 1994: A paramilitary force, the Fedayeen Saddam (Saddam’s Men of Sacrifice), was formed as a Basiji– or Shabiha-type paramilitary force, a fanatically loyal militia outside the usual lines of military command, in this case under the direct command of Saddam’s son Uday. The Fedayeen were used to maintain internal control through espionage, intimidation, and violence, and were to be used in counterinsurgency if a rebellion ever erupted again. The force also took part in terrorism, against internal opponents of the regime like the Kurds, including on at least one occasion a suicide bombing, and at least planned terrorism for abroad. Over time, enforcing internal order meant enforcing Islamic strictures, making the Fedayeen Saddam into something like a mutaween. The Fedayeen Saddam also ran camps that trained up to 8,000 foreign Islamic terrorists and produced gruesome propaganda videos to demonstrate its power—things that came in handy when many of the Fedayeen morphed into al-Qaeda in Mesopotamia (AQM), now known as the Islamic State. January 1995: “[I]n a closed-door meeting of the PAL, Saddam hammered the last nail into the coffin of party ideology,” Baram writes, “when he announced that the Ba’th were no longer against the principle of a state that would unite all the Muslim world”. One of the questions that remains is whether Saddam Hussein became a true believer. Ultimately this question is both unanswerable and irrelevant: Just as with Vladimir Putin’s ostentatious Orthodoxy, what Saddam really believed in his own mind was only ever known to him, but just as in Russia at the present time the effect of State policy with regard to religion and its militant believers, internally and externally, is quite plain. What difference does it make if the man orchestrating jihadist terrorist attacks abroad and reviving religion among the populace at home, killing people for violations of religious law, really believes it? Nonetheless, Baram presents persuasive evidence that “toward the end Saddam became a believer,” and thought that the Islamization measures, the mosque-building, and the contribution of pints of blood to write a Qur’an would win him grace with god. The Faith Campaign was almost certainly started as a “cynical step” to “win popular support,” Baram says. True enough, the public had moved first, falling back on religion in response to the hardships after the Iran and Kuwait wars, and the regime had “decided to jump on the bandwagon.” But, despite the regime’s alliance with the Islamists and the imposition of “shari’a-lite” alienating elements of the Ba’ath Party, Saddam persevered. That the intelligence agencies infiltrated the religious groups, and even executed some of the graduates of the Faith Campaign who rejected the hybrid Ba’athism-Salafism it taught and adopted a purist Salafism that led them into opposition to the regime, is only to be expected in a totalitarian system such as Saddam’s. Indeed, a key part of the Faith Campaign was bringing the religious institutions and clerics “under control”. After the February 1977 riots, the regime promulgated the Law of the Service of Men of Religion, making all Shi’a clerics government officials, with a rise in salaries between 50% and 100% plus many social benefits. Many of these clerics were then either “lured or coerced (or both) to express support for the regime,” Baram writes. Under the Faith Campaign, the nationalizing of religion only increased. In the end, Saddam’s Faith Campaign helped transform Iraq by giving it an extra push in the direction of an authentic Islamization process that had already been set in motion. As frequenting the mosque was less risky … both in the Sunni and the Shi’i parts of Iraq, the mosque eventually became more influential than either the party headquarters or the tribal mudif. … [T]he stature of the ‘ulama was enhanced beyond anything known in modern Iraqi history and they became their communities’ leaders. As for the Sunni Salafis, the relative tolerance strengthened them. When the US invaded Iraq they found a more religious and more sectarian society than had ever been the case since the 1950s. What this should underline is that the sectarian furies and religious extremism now on display in Iraq are not a result of the Anglo-American invasion, but something that the Ba’ath regime had incited to help keep itself in power; those who can believe that a society brutalized and set against itself in this way would have moved peaceably from dictatorship to democracy will believe anything. Many things combined in an evil way in post-Saddam Iraq, destroying the chances for a transition to a decent government. The Allies handled things extremely badly after Saddam’s fall and the Shi’a political class failed to “rise to this historic occasion and to the responsibilities which its own numbers impose on it,” as Kanan Makiya once put it. Iran used the same sectarian faultlines as the Ba’athists to feed the chaos and frustrate Iraqis’ efforts for democracy. But a special degree of blame has to be given to the criminals who ran Saddam’s abattoir regime, and this would be true even if their power over Iraq had ended when Saddam’s statue was hauled down in Firdos Square; the Saddamists had poisoned and ruined Iraqi society by 2003, ensuring that a peaceful transition would be extremely difficult in the best of circumstances. But of course the Ba’athist-Salafists continued to terrorize Iraq after they were driven from power—and still do, as I will explain in the next post. See my previous post on this subject here and my subsequent post here. Post has been updated.